MPSC Civil Judge Syllabus 2019: Latest MPSC Civil Judge Exam Syllabus 2019 subject wise is given on this page. And the officials of the Maharashtra Public Service Commission (MPSC) are going to perform a certain MPSC Civil Judge Selection Process 2019, the Civil Judge Examination 2019 tentatively on the scheduled dates. The Prelims Exam will be conducted on 7th April 2019, and the Mains Exam Date is 18th August 2019. So, check the latest MPSC Civil Judge Exam Pattern and also the subject wise topics given for the महाराष्ट्र लोक सेवा आयोग test as below. Furthermore, we have attached you with the direct link to download the mpsc.gov.in Civil Judge Syllabus in PDF for free. 1.4 How To Prepare For MPSC Examination? The officials of the Maharashtra Public Service Commission (MPSC) are ready to fill the vacant 190 Civil Judge vacancies. So, to complete that procedure they are conducting some MPSC Civil Judge Selection Process 2019. And there are three rounds. Furthermore, the last round in which only talented, skilled candidates get shortlisted that is the Interview. For that round, they have set the maximum marks as 50. So, those who score more and qualify in the test will definitely move further. Candidates who want to know the latest महाराष्ट्र लोक सेवा आयोग Civil Judge Exam Pattern 2019 can get detailed information from this page. And the Prelims & Mains MPSC Civil Judge Exam Pattern 2019 will help you to know the exact structure of the question paper. Furthermore, we have gathered all the examination wise question paper pattern and provided them in the tabular format. So, before going to attempt or prepare for the test, you must check the tables. It gives you the name of the test, subject names and also the questions, total marks and also the time duration allocated for the examination. 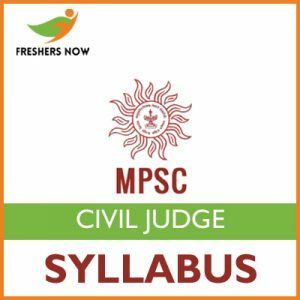 Candidates who are about to start preparing for the test need to know the MPSC Civil Judge Exam Syllabus 2019 initially. Then, they can know what to prepare for the महाराष्ट्र लोक सेवा आयोग Civil Judge Examination 2019. Furthermore, you can get detailed topics for the test according to the above test pattern. So, make use of the given information to prepare a perfect plan of schedule. Without having the accurate MPSC Civil Judge Syllabus 2019, Test Pattern, no candidate can easily attempt the test. So, for that purpose, we have clearly mentioned you with the latest syllabus so that you can prepare as much as you can. Below sections will give you the subject wise topics in listed format and also the direct link to download the mpsc.gov.in Civil Judge Syllabus 2019 PDF is also attached. How To Prepare For MPSC Examination? Get the MPSC Civil Judge Syllabus 2019 and MPSC Civil Judge Exam Pattern 2019 from this page. Arrange the given topics as per the importance and your difficulty level. Follow the program and complete the preparation for the test as soon as possible. Also, practice MPSC Civil Judge Solved Question Papers which are also available on our webpage. Now, start preparing for the Civil Judge Examination with the help of the MPSC Civil Judge Syllabus 2019 as given on this article. So, to get all such latest news and Syllabus, Exam Pattern, Previous Papers, you need to stick on to us on our webportal @ FreshersNow.Com.